Our list of some of this year's historic Fourths across the country. Where will you spend the Fourth? 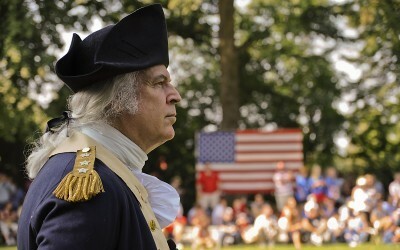 Do you know of a July 4th celebration we should add to this list for history lovers? Add your recommendation in the comments and we may add it to the master list of America's Historic Fourths for 2018. A 6-day festival with over 50 events happening in different parts of Philadelphia. The celebration includes multiple fireworks displays, parades, patriotic ceremonies, free concerts, free museum days, community events, free outdoor movie screenings, block parties and more. In the morning of the 4th of July, the official Independence Day Commemoration will begin with a flag raising at City Hall Plaza followed by a parade to the Granary Burial Ground where a wreath-laying ceremony will be conducted in honor of our patriots. At the Old State House, there is a public reading of the Declaration of Independence at 10 am from the balcony just as it was read to the citizens of Boston for the first time on July 8, 1776. 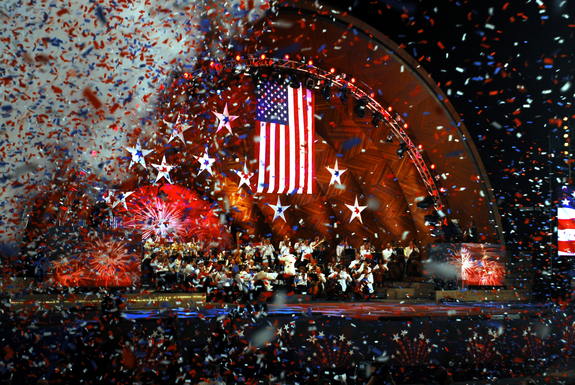 This free event which draws thousands of visitors features the Boston Pops Orchestra, a 20 minute spectacular fireworks show and performances by pop sensation Andy Grammer, American folk rock singer-songwriter Melissa Etheridge and Leslie Odom, Jr., of Hamilton fame. 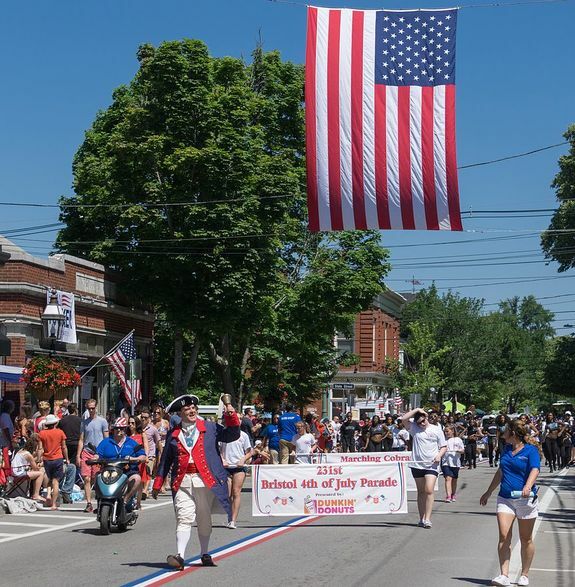 This 4th of July tradition began in 1785 and is now the oldest Independence Day parade. The celebration officially starts on Flag Day, June 14th where several events are scheduled such as a series of concerts in the Independence Park, firework shows, Drum Corps Show, a Firefighters muster, a 4th of July Ball and many more. 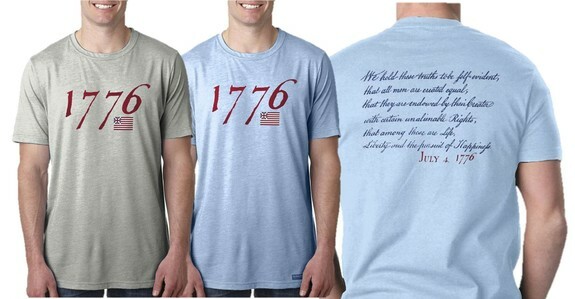 "We hold these truths - July 4, 1776” T-shirt in light blue heather and silver. Also in a women's stretch tank top in grey. Get them in time before the Fourth. Place your advance orders now. 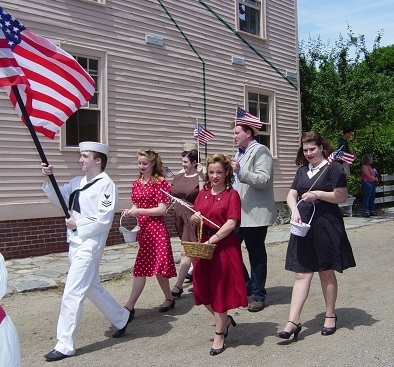 Enjoy a classic old-fashioned 4th of July celebration on this three-day event featuring something for everyone, from maritime art to a 1940s-style swing dance, children’s bike and wagon parade, an old-fashioned field day and many more. On this four-day event, visitors can take part in a citizens' parade, play 19th-century style "base ball," march with the militia, make a tri-cornered hat, and sign their "John Hancocks" on a giant copy of the Declaration of Independence. Witness the firing of a reproduction cannon and on July 4, watch and be inspired by a citizen naturalization ceremony on the Village Common. 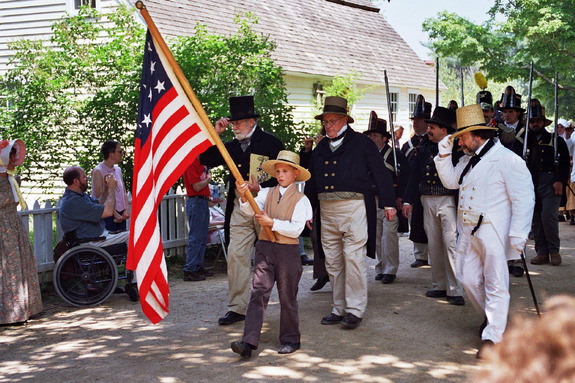 This Independence Day celebration set against an 1820's American farm will be featuring historic games, the reading of the Declaration of Independence, militia drill and firing, traditional music and dancing, ironwork and textile demonstrations and a lot more. On its 18th year, the annual 4th of July celebration in Ringwood Manor has become a beloved tradition for many families in the northern New Jersey area. 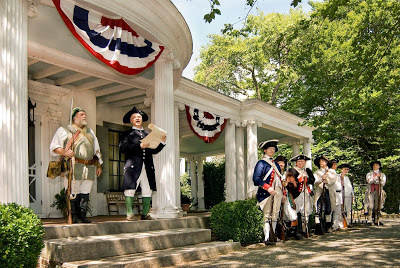 Featuring a dramatic reading of the Declaration of Independence to the crowd gathered in front of the historic house, colonial demonstrations and dancing, games, flag raising and musket firing and you may even get a chance to sign your own Declaration. Own a historic printing of the Declaration of Independence and the United States Constitution from the Printing Office of Edes and Gill in Boston. The house will be open on this free for all event, staffed by costumed docents who will discuss the rooms and life in the 18th century. Visitors will be able to participate in hands-on activities such as writing with a quill pen, trying colonial-era toys, and making rag dolls. Enjoy old-fashioned crafts and games for the children, and free lemonade for all. Taking place rain or shine, celebrate the Independence Day with the first commander in chief, George Washington and his wife, Martha. 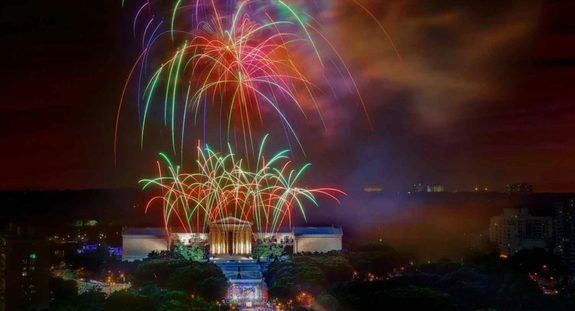 Featuring a dazzling made-for-daytime fireworks display over the Potomac River, a naturalization ceremony, military re-enactments, a wreath laying ceremony at the tomb and even a free birthday cake. 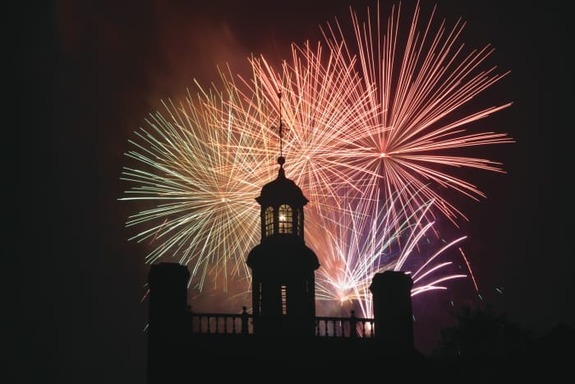 At the historic Duke of Gloucester Street in Williamsburg, the anniversary of the birth of our nation will be celebrated with a salute to the original thirteen states, reading of the Declaration of Independence, colonial games that can be enjoyed throughout the day and a stunning fireworks display. The perfect t-shirt to wear on your own history road trip, "1776 Historic America Road Trip to the Birthplaces and Homes of the Signers of the Declaration of Independence" T-Shirt. Available for a limited time only. 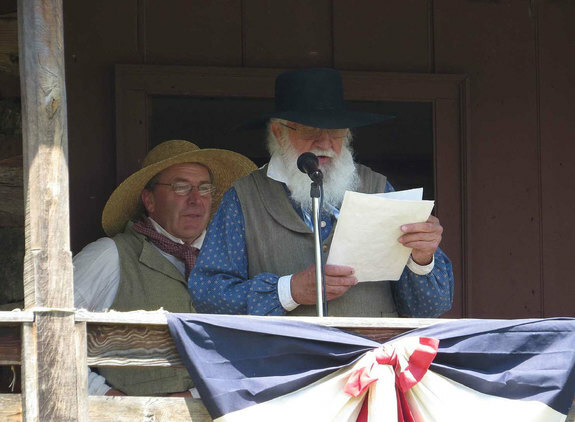 Celebrate an 1880’s Independence Day, with 38-gun salutes revering the states of the period. The fort will be decked out in patriotic finery including banners, flags and buntings accompanied by patriotic music. 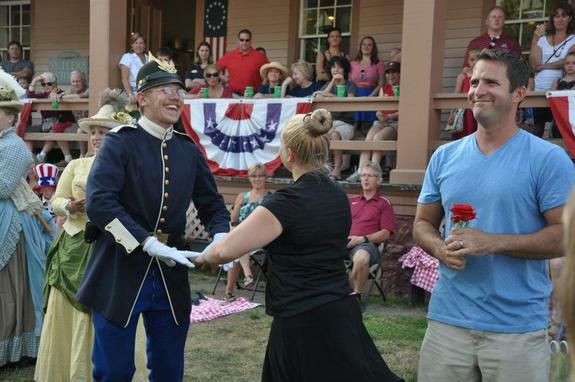 Adults and children alike will enjoy taking part in Victorian dances and games. This annual event features plenty of activities where the whole family can take part of including a parade through the historic district, delicious foods, arts and crafts vendors, contests, rodeo, live shows and more. 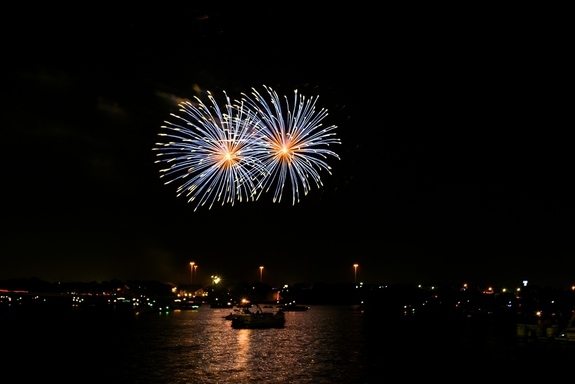 To top off the festivities, an extreme pyrotechnics fireworks show will be on display over Lake Granbury. 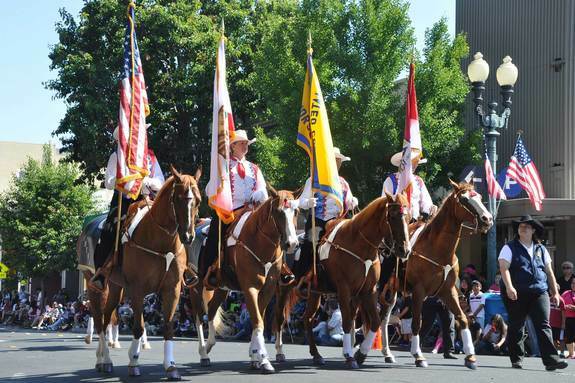 Celebrate with the largest Independence Day Parade in Northern California attracting thousands of visitors since 1939. Afterwards, enjoy the festival through great food, arts and crafts booths and a battle of the bands. Cap off the day's celebration with a fireworks show over the Port of Redwood City and can be seen from all over the mid-Peninsula. Celebrate aboard the historic USS Hornet and explore the ship, enjoy family activities such as a flight simulator, hands-on science and games, a meal at the Hanger and Flight decks, live music and entertainment and a fireworks show. Celebrate "the great birthday of our republic" at the 55th annual Independence Day Celebration and Naturalization Ceremony at Monticello. Featured speaker for the ceremony is David N. Saperstein, Saperstein, former U.S. ambassador-at-large for international religious freedom. Afterwards, take a free tour of Monticello. If you have a favorite event that belongs on this list, please let us know. And if you're looking for a special gift for a history lover, check out our store, which is what funds the operation and expansion of The History List. You'll find shirts and stickers with our original design, special commemorative shirts, and signed books by noted historians.